Students at Michael A. Maroun Elementary School recently “hunted” and “gathered” food for a traditional Thanksgiving Day “feast” in their physical education classes. Maroun second grader Sara Speich, left, jumps for joy after she successfully threw her ball into a bucket, which represented her ‘gathering’ vegetables for a Thanksgiving feast. 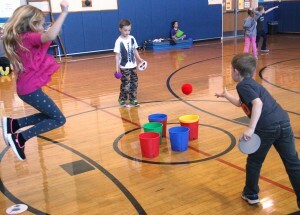 All students participated in the physical education event in honor of the recent Thanksgiving holiday. Physical education teacher Alice Benjamin said students were taught that while people now drive to the store, purchase food to cook or order pre-cooked meals, those who joined together for the first Thanksgiving had to hunt or gather their food themselves before it appeared on the table. 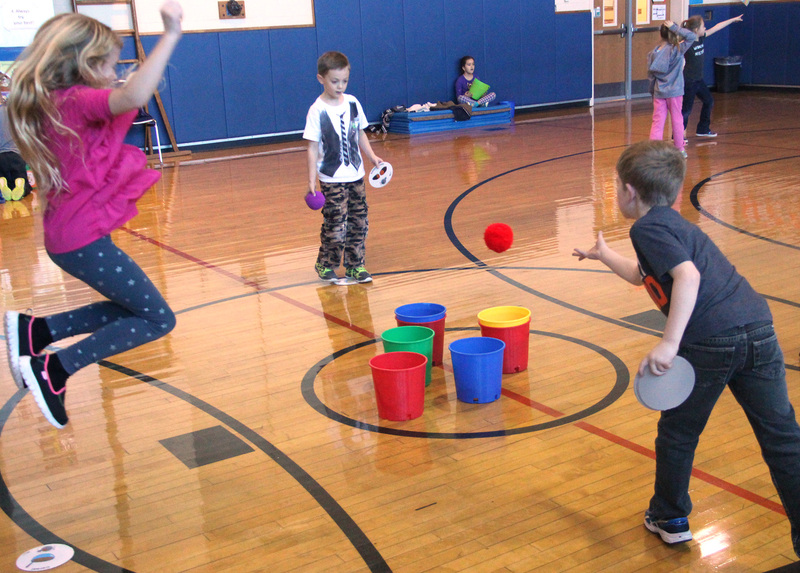 Several fun physical endurance stations were set up in the gymnasium for a second grade class, such as bowling for turkey, building a food pyramid out of buckets representing different food groups, gathering food tossed into nets, and throwing spears (foam) to catch food. Challenges intensified with older grades. At the conclusion of each class, students spoke with teachers about whether they thought they would have made good hunters or gatherers.